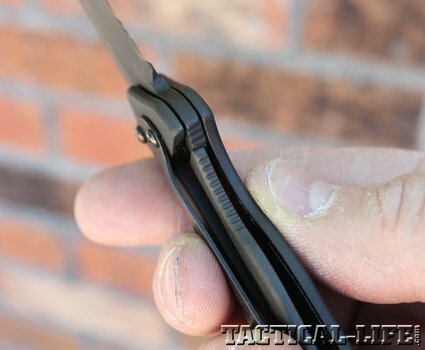 Daniel Defense/Kershaw offers a reliable edged weapon backup for today's rifle, the Black Gun Blade knife! Daniel Defense chose to partner with Kershaw Knives to manufacture a Daniel Defense Folding Knife, utilizing a Ken Onion design and a Daniel Defense Blade design purposed to be an everyday carry knife. 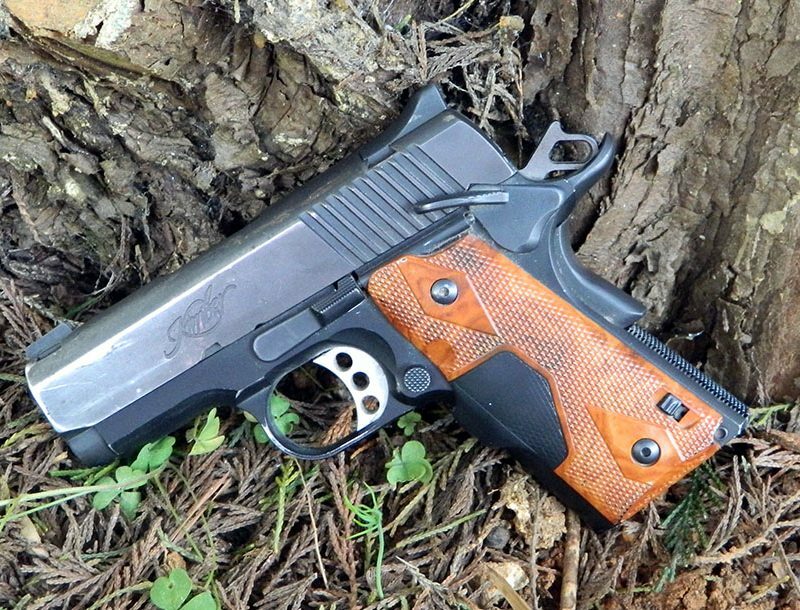 No good gun enthusiast should leave home without one. If you know anything at all about M4-style rifles, you’ve probably heard of Daniel Defense. Founded at the turn of the 21st century by firearms enthusiast and lifelong shooter Marty Daniel, it began by producing innovative, high-quality rails and other aftermarket parts for black rifles. 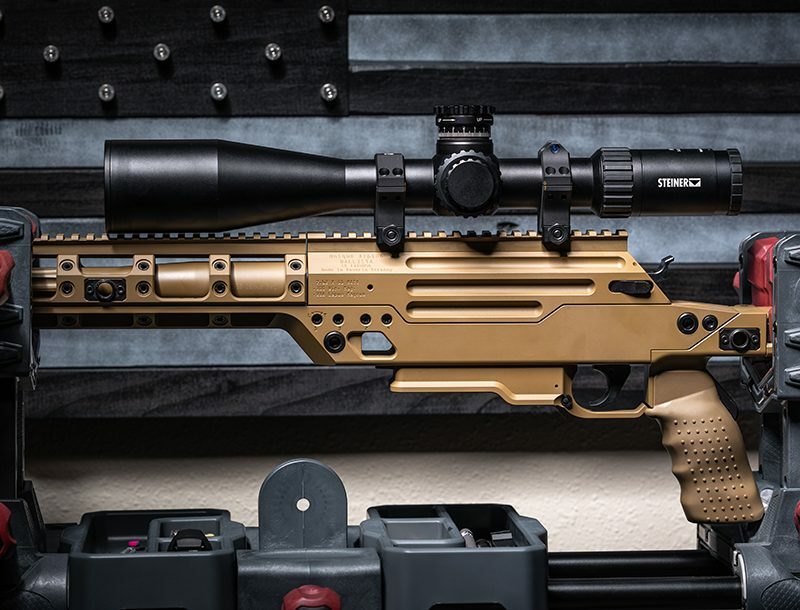 These parts quickly found favor among savvy shooters and armed professionals, fueling the rapid growth of the company and the scope of its product line. Daniel Defense now offers a staggering array of M4-style rifles in various calibers, as well as rails, mounts, barrels, and many other accessories. All of their parts and finished guns are proudly manufactured in their state-of-the-art 38,000-square-foot facility in Black Creek, Georgia. 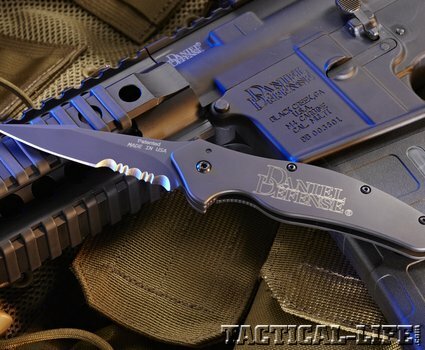 Like all good gun people, the folks at Daniel Defense are also knife people. They appreciate the functional value of a good blade and wanted to offer their customers a distinctive, high-performance knife that reflected the same qualities and commitment they put into their rifles. The result of that effort is the Daniel Defense Folding Knife, made for them by Kershaw. According to Daniel Defense, the company did extensive research during their search for a manufacturer and based their choice on a strict set of criteria. Their most important requirement was that the knife be 100% made in the USA—just like their own products. They also wanted a knife that ensured swift, positive deployment, offered ease of carry and concealment, and provided both aggressive performance and versatility in use. The Daniel Defense folder opens by flipper only. Note the absence of thumb studs on the blade. After thoroughly doing their homework, Daniel Defense chose Kershaw Knives because they felt that Kershaw best exemplified both the commitment to quality and the patriotic pride that are cornerstones of their own company. Kershaw jumped at the opportunity and promptly assigned their engineers and their star designer, renowned custom knifemaker Ken Onion, the task of developing a distinctive knife to meet Daniel Defense’s needs. 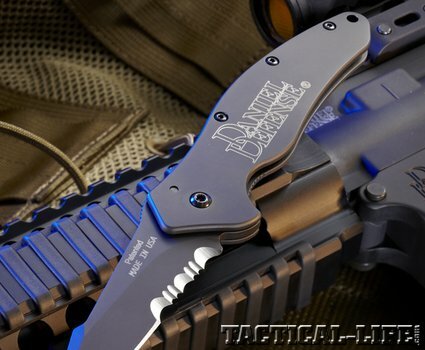 Daniel Defense worked closely with Kershaw’s design team and methodically developed a folding knife that met or exceeded all their performance criteria. It also offered a uniquely different blade profile while still retaining a highly recognizable Kershaw flair. The Daniel Defense Folder features a very sturdy frame lock mechanism that offers excellent engagement on the blade’s tang ramp. The basis for the Daniel Defense Folding Knife was the handle of the Kershaw Shallot. Precision machined from 410 stainless steel and finished with a stealthy black tungsten DLC (Diamond-Like Carbon) coating, it is also the foundation of a stout frame-lock mechanism. The handle is also home to a patented SpeedSafe assisted-opening mechanism that provides quick, reliable one-handed blade deployment. To clearly show the Daniel Defense “colors,” their logo is prominently laser engraved on the handle’s obverse side. The dramatic blade shape of the Daniel Defense folder defies easy description. Although it is single-edged, it features a wicked dagger-like taper and an unsharpened swedge that stands slightly proud of the blade spine. Designed by Ken Onion to meet Daniel Defense’s desire to have an aggressive yet highly functional multi-purpose blade, whatever it’s best called, it hits the mark. The 3.5-inch blade has a partial flat grind and the first 1.25 inches of the combination edge is serrated. Like the handle, it has a handsome black tungsten DLC coating and is laser-engraved with Daniel Defense’s name, city, and state on the reverse side and “Patented, Made in USA” on the show side. The knife’s aggressive blade shape includes a partially serrated edge that devours fibrous materials. Here it makes short work of a piece of manila rope. To deploy the knife’s blade, there is an understated but highly effective flipper that flows gracefully into the lines of the knife in both the open and closed positions. Closed, it extends about an 1/8-inch above the back of the handle. Open, it is contained in the handle’s forefinger groove, which provides a reassuring stop for the index finger to keep one’s hand off the blade. The Daniel Defense Folding Knife offers two carry options: tip-up or tip-down carry, both on the user’s right side. The clip is secured via two Torx screws and those who like fobs and lanyards will be happy to know that the handle also includes a 0.15-inch lanyard hole. The folks at Daniel Defense rightfully acknowledged that most “tactical” folding knives are used almost exclusively for utilitarian purposes; however, they also admitted that one of their goals for their folding knife design was to function effectively as a personal-defense weapon. With that in mind, my first order of business in evaluating the knife was to assess the design qualities that would allow it to be carried, drawn, and quickly deployed under stress. The knife came configured for tip-down carry. Although this is not normally my preference—especially for assisted openers—it actually made a lot of sense for this design. Since it has no thumb-opening option, the blade has to be deployed with the flipper. To do that, it’s necessary to grip the knife very high on the handle, close to the pivot pin. Drawing from tip-down carry and allowing the knife to pivot in my hand as it cleared the pocket soon became a fluid, positive motion. The tip-down carry configuration of the Daniel Defense Folder also allowed the clip to cover the lock bar, providing both a solid grip and a “stand-off” when opening the blade. 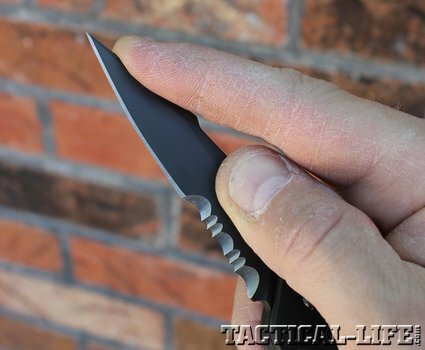 This is an important but often overlooked aspect of frame-lock knives. With many frame-lock designs, gripping the handle automatically places your fingertips on the lock bar. A firm grip pushes the bar against the blade or forces the detent ball into its recess, binding the blade and preventing it from opening smoothly. A broad, well-positioned clip provides a solid purchase and eliminates this problem. Once gripped properly, the knife’s SpeedSafe mechanism did its job exceptionally well. The size and position of the flipper made it easy to find by tactile sense and offered excellent leverage to initiate the blade opening. Even better, the “over-center” leverage of the kick spring in the closed position, the lack of thumb studs, and the knife’s narrow profile collectively make accidental opening of the blade almost impossible. As I’ve noted in my previous writings for TK, that’s a serious concern when carrying assisted openers tip-down. If that’s still a concern, you’ll be happy to know that the knife also draws and opens very smoothly when configured for tip-up carry. Thanks to its slim handle profile, the Daniel Defense Folder can also be grasped in more of a “foil” grip (with the thumb on the flat of the handle) during opening. Rather than using the tip of the index finger on the flipper, I used the middle segment of the finger. This grip puts more skin on the handle, providing greater control during opening. 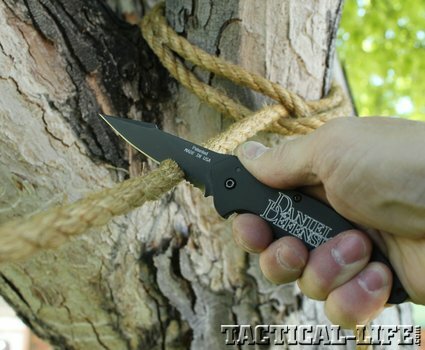 Content that I could get the knife into action when I needed it, I began carrying the Daniel Defense Folding Knife as a utility knife to see how it performed everyday tasks. Like all other Kershaw knives I’ve used, it had a keen edge and great edge geometry, so it cut extremely well. Its unique blade shape lends itself well to choking up for a scalpel-style grip, with the index finger extended along the back of the blade. The acute point of the blade makes the Daniel Defense folder great for detail work—especially when held in a scalpel-style grip. 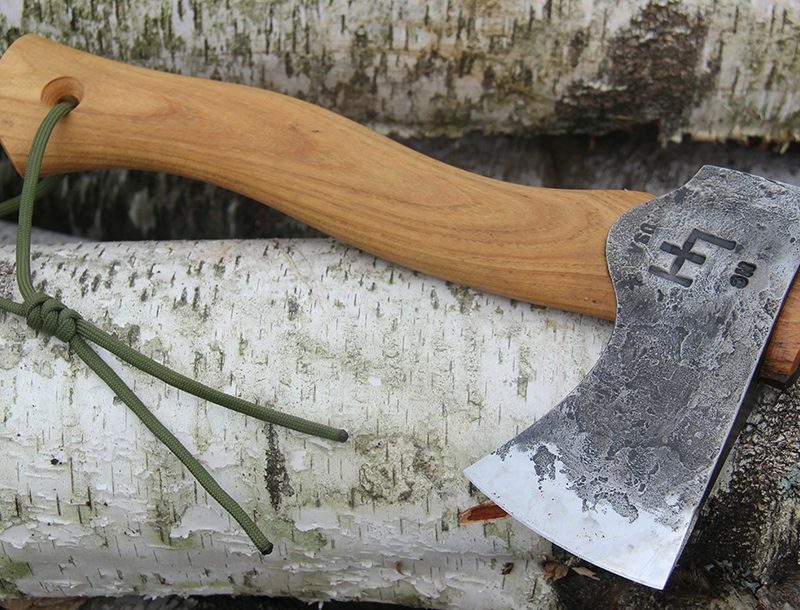 Gripped conventionally, the handle’s excellent ergonomics enabled the blade to cut with surprising power for its size. This was particularly true when cutting with the serrated section of the edge, which easily powered through everything I put in its path, including seat belts, cord, and some very significant hunks of rope. During literally hundreds of openings, the SpeedSafe mechanism never hiccupped. The blade always opened with authority and the frame-lock mechanism locked securely. Release of the lock was a conscious effort—just as it should be—but was always easily accomplished. 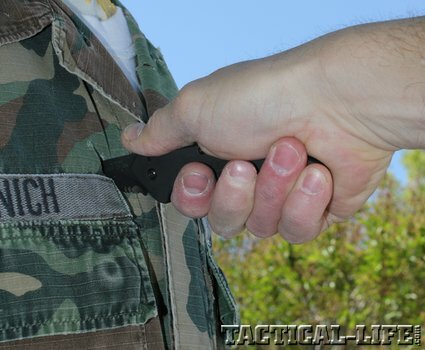 To assess the Daniel Defense Folding Knife’s potential as a personal-defense tool, I put it to the test against a variety of cutting targets, including everything from free-hanging sheets of paper to my benchmark standard, a meat-wrapped wooden dowel affectionately known as “pork man.” To replicate the resistance of typical clothing, the latter was dressed in a pant leg from a pair of jeans and the sleeve of a down-filled winter jacket. The knife didn’t care. It easily powered through them, producing deep cuts with the potential for serious stopping power. Despite numerous cuts through double-walled corrugated cardboard, both the edge and the DLC blade coating of the Daniel Defense Folder were still going strong. 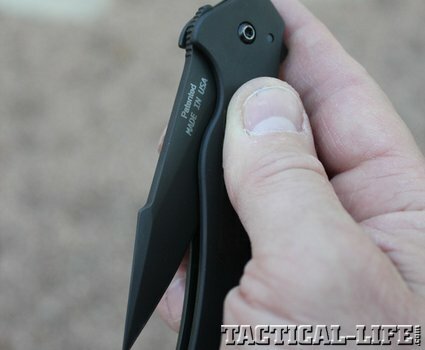 The acutely tapered point and swedge of the Daniel Defense Folder also make the knife a potent thrusting weapon. I tested it in both standard and reverse grips against a foam mannequin torso covered in a winter jacket and it easily penetrated the full length of the blade with very little effort. I then folded the leg of a pair of denim jeans multiple times to create 16 layers of material and placed it over a “pork man” target. Again, the knife’s point sailed through the multiple layers without a problem. Although the handle of the Daniel Defense Folder is not textured, its thoughtfully designed ergonomics and pronounced index-finger groove provided a very secure grip during all testing. The tapered shape of the handle fits the natural contours of the hand, wedging in place on hard impact and effectively transferring the force of the impact shock into the meaty portion of the palm. Many tactical companies that want to offer a signature knife are content to stamp their name on another manufacturer’s product and call it good. Daniel Defense and Kershaw don’t work that way and clearly aspire to a much higher standard. They and Ken Onion put exceptional effort into this project and have created a distinctive, highly functional knife that truly achieves all of Daniel Defense’s stated goals.